Adjusting the steering wheel while driving, or driving without the steering wheel adjustment feature locked could cause the driver to lose control of the vehicle. - Push release lever 1 down completely. The steering column is unlocked. - Adjust the steering wheel to the desired position. - Push release lever 1 up completely. The steering column is locked. - Check if the steering column is locked. When doing so, try to push the steering wheel up or down or try to move it in the fore-and-aft direction. - To switch on/off: turn the lever in the direction of arrow 1 or 2. Indicator lamp 3 lights up or goes out. Vehicles without KEYLESS-GO: when you remove the key from the ignition lock, the steering wheel heating is deactivated. Vehicles with KEYLESS-GO: when you switch off the ignition and open the driver's door, the steering wheel heating is deactivated. The steering wheel heating has switched off prematurely or cannot be switched on. The vehicle's electrical system voltage is too low because too many electrical consumers are switched on. The EASY-ENTRY/EXIT feature makes getting in and out of your vehicle easier. You can activate and deactivate the EASYENTRY/EXIT feature in the on-board computer. - Move steering wheel adjustment stalk. - Press one of the memory position buttons. 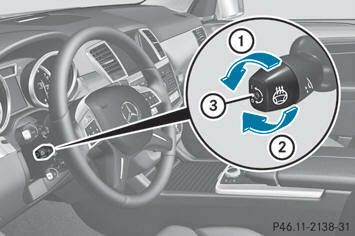 - Press memory button M.
Let the system complete the adjustment procedure before setting the vehicle in motion. 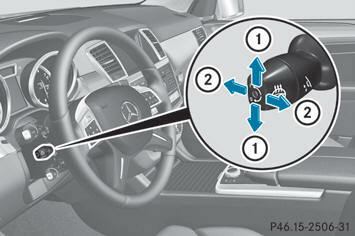 All steering wheel adjustment must be completed before setting the vehicle in motion. Driving off with the steering wheel still adjusting could cause the driver to lose control of the vehicle. upwards if it has not already reached the upper end stop. 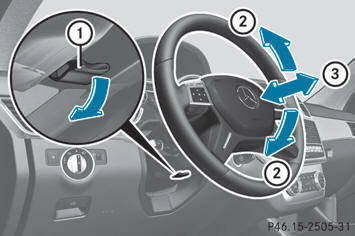 The steering wheel is moved to the last selected position when: - the driver's door is closed. - you insert the SmartKey into the ignition lock. - you press the Start/Stop button once on vehicles with KEYLESS-GO. When you close the driver's door with the ignition switched on, the steering wheel is also automatically moved to the previously set position. The last position of the steering wheel is stored when you switch off the ignition or when you store the setting with the memory function. If the crash-responsive EASY-EXIT feature is triggered in an accident, the steering column will move upwards when the driver's door is opened. This occurs irrespective of the position of the SmartKey in the ignition lock. This makes it easier to exit the vehicle and rescue the occupants. The crash-responsive EASY-EXIT feature is only operational if the EASY-EXIT/ENTRY feature is activated in the on-board computer.